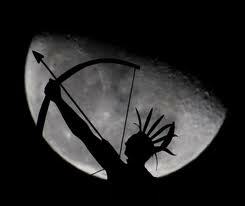 An Iroquois myth that I have chosen to embellish! In the beginning there was no world, no land, no creatures of the kind that are around us now, and there were no men. But there was a great ocean which occupied space as far as anyone could see. Above the ocean was a great void of air. And in the air there lived birds of the sea: in the ocean lived the fish and the creatures of the deep. Far above this unpeopled world, there was a Sky World. Here lived gods who were like people- like Iroquois. In the Sky World there was a man who had a wife, and the wife was expecting a child. The woman became hungry for all kinds of strange delicacies, as women do when they are with child. She kept her husband busy almost to distraction finding delicious things for her to eat. In the middle of the Sky World there grew a Great Tree which was not like any of the trees that we know. It was tremendous; it had grown there forever. It had enormous roots that spread out from the floor of the Sky World. And on its branches there were many different kinds of leaves and different kinds of fruits and flowers. 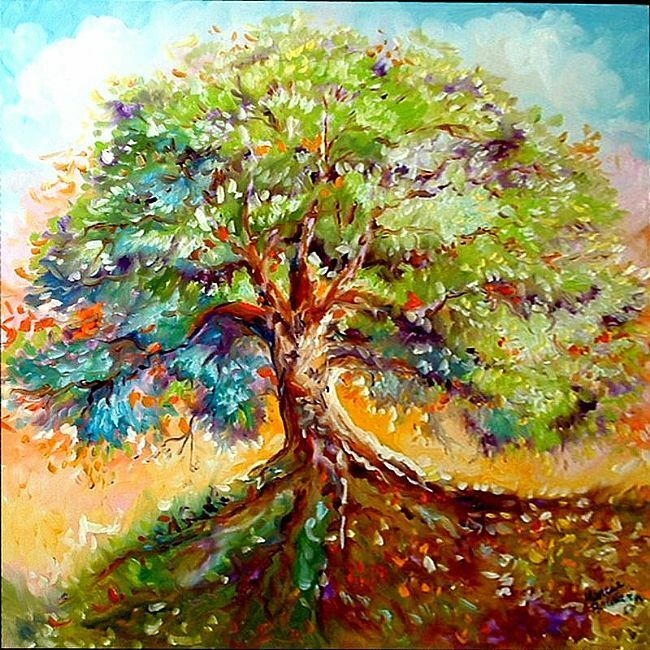 The tree was not supposed to be marked or mutilated by any beings who dwelt in the Sky World. 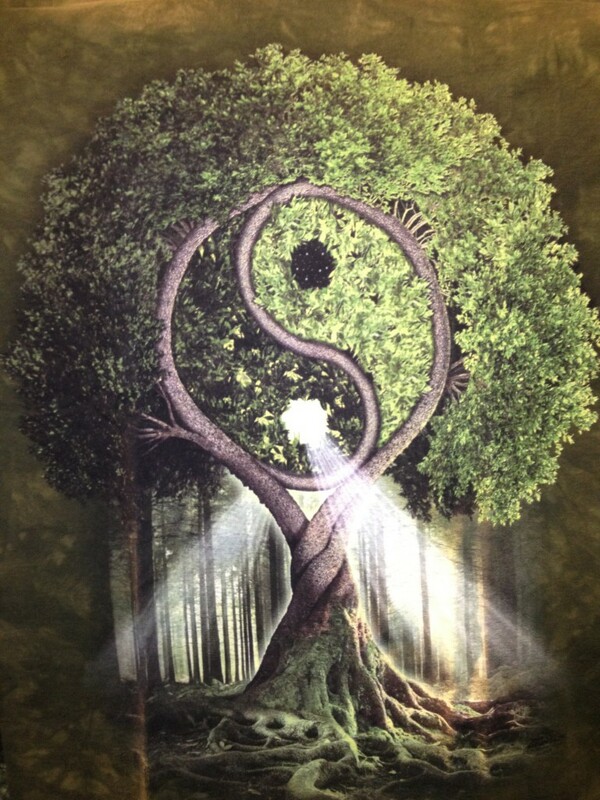 It was a sacred tree that stood at the center of the universe. The woman decided that she wanted some bark from one of the roots of the Great Tree- perhaps as food or as a medicine, we don’t know. She told her husband this. He did not like the idea. He knew it was wrong. But she insisted, and he gave in. So he dug a hole among roots of this great sky tree, and he bared some of its roots. But the floor of the Sky World wasn’t very thick, and he broke a hole though it. He was terrified, for he had never expected to find empty space underneath the world. But his wife was filled with curiosity. He wouldn’t get any of the roots for her, so she set out to do it herself. She bent over and she looked down, and she saw the ocean far below. She leaned down and struck her head though the hole and looked all around. No one knows just what happened next. Some say she slipped. Some say that her husband, fed up with all the demands she had made on him, pushed her. So she fell through the hole. As she fell, she frantically grabbed at its edges, but her hands slipped. However, between her fingers there clung bits of things that were growing on the floor of the Sky World and bits of the root tips of the Great Tree. And so she began to fall toward the great ocean far below. The birds of the sea saw the woman falling, and they immediately consulted with each other as to what they could do to help her. Flying wingtip to wingtip, they made a great feathery raft in the sky to support her, and thus they broke her fall. But of course it was not possible for them to carry the woman very long. Some of the other birds of the sky flew down to the surface of the ocean and called up to the ocean creatures to see what they could do to help. The great sea turtle agreed to receive her on his back. The birds placed her gently on the shell of the turtle, and now the turtle floated about on the huge ocean with the woman safely on his back. The beings in the Sky World paid no attention to this. They knew what was happening, but they chose to ignore it. When the woman recovered from her shock and terror, she looked around her. All that she could see were the birds and the sea creatures and the sky and the ocean. And the woman said to herself that she would die. But the creatures of the sea came to her and said they would try to help her and asked her what they could do. She told them that if they could find some soil, she could plant the roots stuck between her fingers, and from them plants would grow. The sea animals said perhaps there was dirt at the bottom of the ocean, but no one had ever been down there so they could not be sure. If there was dirt at the bottom of the ocean, it was far, far below the surface in the cold deeps. But the animals said they would try to get some. One by one the diving bird and animals tried and failed. 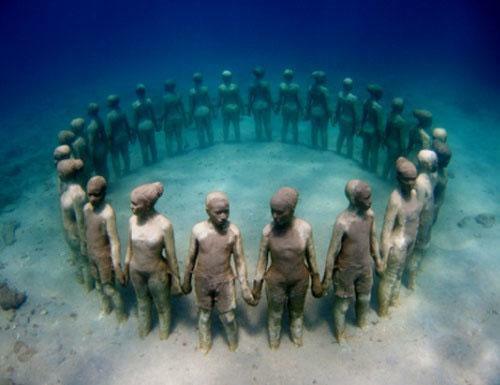 They went to their limits of endurance, but they could not get to the bottom of the ocean. 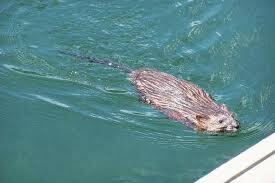 Finally, the muskrat said he would try. He dived and disappeared. all the creatures waited, holding their breath, but he did not return. After a long time, his little body floated to the surface of the ocean, a tiny crumb of earth clutched in his paw. He seemed to be dead. They pulled him up on the turtle’s back and they sang and prayed over him and breathed air into his mouth, and finally, he stirred. Thus it was the muskrat, Earth-Diver, who brought from the bottom of the ocean the soil from which the earth was to grow. The woman took the tiny clod of dirt and laced it in the middle of the great sea turtle’s back. Then the woman began to walk in a circle around it, moving in the direction that the sun goes. The earth began to grow. When the earth was big enough, she planted roots she had clutched between her fingers when she fell from the Sky World. Thus the plants grew on the earth. To keep the earth growing, the woman walked as the sun goes, moving in the direction that the people still move in dance rituals. She gathered roots and plants to eat and built herself a little hut. After a while, the woman’s time came, and she was delivered a daughter. 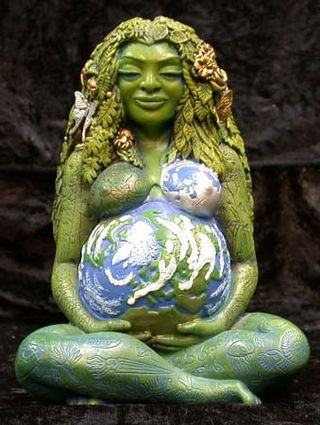 The woman and her daughter kept walking in a circle around the earth, so that the earth and plants would continue to grow. They lived on the plants and roots they gathered. The girl grew up with her mother, forever cut off from the Sky World above, knowing only the birds and the creatures of the sea, seeing no other beings like herself. One day, when the girl had grown to womanhood, a man appeared. No one knows for sure who this man was. He had something to do with the gods above. Perhaps he was the West Wind. As the girl looked at him, she was filled with terror, and amazement, and warmth, and she fainted dead away. As she lay on the ground, the man reached into his quiver, and he took out two arrows, one sharp and one blunt, and he laid them across the body of the girl, and quietly went away. When the girl awoke from her faint, she and her mother continued to walk around the earth. After a while, they knew that the girl was to bear a child. They did not know it, but she was to bear twins. Within the girl’s body, the twins began to argue and quarrel with one another. There could be no peace between them. As the time approached for them to be born, the twins fougt about their birth. The right-handed twin wanted to be born in the normal way, as all children are born. But the left-handed twin said no. He said he saw light in another direction, and said he would be born that way. The right-handed twin beseeched him not to, saying that he would kill their dear mother. But the left-handed twin was stubborn. He went in the direction where he saw the light. But he could not be born through his mother’s mouth or her nose. He was born through her armpit, and killed her. And meanwhile, the right-handed twin was born in the normal way, as all children are born. The twins met in the world outside, and the right-handed twin accused his brother of murdering their mother. But the grandmother told them to stop their quarrelling. They buried their mother. And from her grave grew the plants which the people still use. 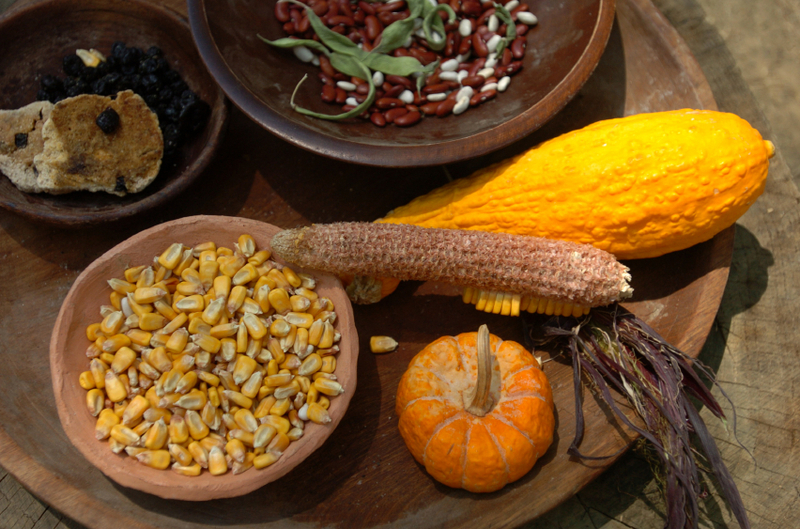 From her head grew the corn, the beans, and the squash “our supporters, the three sisters”. And from her heart grew the tobacco, which the people still use in ceremonies and by whose upward floating smoke they send thanks. The women call her “our mother”, and they dance and sing in the rituals so that the corn, the beans, the squash may grow to feed the people. But the conflict of the twins did not end at the grave of their mother. And, strangely enough, the grandmother favored the left-handed twin. The right-handed twin was angry, and he grew more angry as he thought how his brother had killed their mother. The right-handed twin was the one who did everything just as he should. He said what he meant, and he meant what he said. He always told the truth, and he always tried to accomplish what seemed to be right and reasonable. The left-handed twin never said what he meant or meant what he said. He always lied, and he always did everything backward. You could never tell what he was trying to do because he always made it look as if he were doing the opposite. He was the devious one. These two brothers, as they grew up, represented two ways of the world which are in all the people. The Indians did not call these right and wrong. They called them the straight mind and the crooked mind, the upright man and the devious man, the right and the left. The twins had creative powers. They took clay and modeled it into animals, and they gave these animals life. And in this they contended one another. The right-handed twin made the deer and the left-handed twin made the mountain lion which kills the deer. But the right-handed twin knew there were more deer than mountian lions. And he made more animals. He made the ground squirrel. The left-handed twin saw that the mountain lion could not get to the ground squirrel, who digs a hole so he made the weasel. And although the weasel can go straight into the ground squirrel’s hole and kill him, there are lots of ground squirrels and not so many weasels. Next the right-handed twin decided he would make an animal that the weasel could kill, so he made the porcupine. But the left-handed twin made the bear, who flips the porcupine over on his back and tears out his belly. And the right-handed twin made berries and fruits of other kinds for his creatures to live on. The left-handed twin made briars and poison ivy, and the poisonous plants like baneberry and the dogberry, and the suicide root with which people kill themselves when they go out of their minds. And the left-handed twin made medicines, for good and evil, for doctoring and for witchcraft. The world the twins made was a balanced and orderly world, and this was good. The plant-eating animals created by the right-handed twin would eat up all the vegetation if their number was not kept down by the meat-eating animals which the left-handed twin created. But if these carnivorous animals ate too many other animals, then they would starve, for they would run out of meat. So the right-handed and the left-handed twins built balance into the world. As the twins became full-grown men, they still contested with one another. No one had won, and no one had lost. And they knew the conflict was becoming sharper and sharper and one of them would have to vanquish the other. And so they came to the duel. They started with gambling. They took a wooden bowl, and in it they put wild plum pits. One side of the pits was burned black, and by tossing the pits in the bowl, and betting on how these would fall, they gambled against one another, as the people still do in the New Year’s rites. All through the morning they gambled at this game, and all through the afternoon, and the sun went down. And when the sun went down, the game was done, and neither one had own. So they went onto battle one another at lacrosse game. And they contested all day, and the sun went down, and the game was done. And neither had won. And now they battled with clubs, and they fought all day, and the sun went down, and the fight was done. But neither had won. And they went from one duel to another to see which one would succumb. Each one knew in his deepest mind that there was something, somewhere, that would vanquish the other. But what was it? Where to find it? Each knew somewhere in his mind what it was that was his own weak point. They talked about this as they contested in these duels, day after day, and somehow the deep mind of each entered into the other. And the deep mind of the right-handed twin lied to his brother, and the deep mind of the left-handed twin told the truth. On the last day of the dual, as they stood, they at last knew how the right-handed twin was to kill his brother. Each selected his weapon. The left-handed twin chose a mere stick that would do him no good. But the right-handed twin picked out a deer antler, and with one touch he destroyed his brother. And the left-handed twin died, but he died and he didn’t die. The right-handed twin picked up his body and cast it off the edge of the earth. And some place below the world, in the land of the eternal abyss, the left-handed twin remained for some time. Having killed his brother, the right-handed twin returned to his grandmother. And she met him in anger. She threw food out of the cabin onto the ground, and she said theat he was a murderer, for he had killed his brother. He grew angry, and told her she had always helped his brother, who had killed their mother. In anger, he grabbed her by the throat and cut her head off. Her body he threw into the ocean, and her head into the sky. There “Our Grandmother, the Moon” still keeps watch at night over the realm of her favourite grandson. The right-handed twin has many names. One of them is Sapling. It means smooth, young, green, fresh and innocent, straightforward, straight-growing, soft and pliable, teachable and trainable. These are the ways of describing him. Our young Sapling was quite sorry at the state of affairs and he wept. 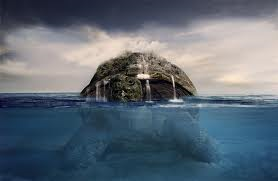 He wept so long and so hard that his tears began to flood the earth and all the wonderful creatures, animals and fruits that his grandmother, his mother, his twin brother and himself had brought to creative fruition. The West Wind saw this from the Sky World and took pity on him, his son. In the world up above, it was a very special time, a sacred time that can only be counted every 5,125 turns of the earth around the sun. And when this time occurred, the Tree of Life bore an ambrosia fruit that everyone in the Sky World craved, therefore, it was permitted during these holy periods to eat of the fruit of the Tree of Life. The merrymaking and general mayhem of creative power during these heightened occasions is what creates new worlds, new life forms and eternal galaxies. Thus the West Wind ate of the fruit, and created the portal that opened from the Sky World to the Earth below and he blew into the portal such a forceful breath that a spinning rainbow vortex swirled from one world to the other and picked up the right-handed twin and lifted him right up into the Sky World. The right-handed twin was in shock, confusion and a coma-like state for many days until the smoke of the tobacco reached him from the humans who were grieving his abscence. And then he wept again to realize his Fate. Although he was quite happy to be back in the Land of All Origins, he was worried and fretful about his greatest creation, the humans. He knew that without his guidance and protection they could easily be lost to the folly of his left-handed twins’ ways. So he beseeched the Sky Walkers to allow him to send the humans on the Earth below some helping aid. 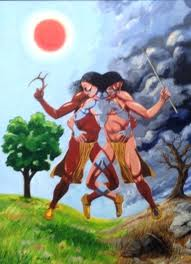 The right-handed twin, who became known as He Who Holds up the Skies, Master of Life, and Great Creator, ate of the fruit of the Tree of Life and spit the seeds down to the Earth so that in this way the earth dwellers could also come to know of this sacred tree and its magical creative powers. Everywhere these seeds landed were considered power places which offered higher vibrations akin to the Sky World and those sensitive to the energies could receive guidance and knowledge from dwelling in such spaces. The Master of Life, our right-handed twin, also sang a song which travelled from his world to the Earth by way of the West Wind and those who had ears to hear this melody became the shamans, the healers, the medicine men and women who through their own power songs could open up the portals between the worlds ensuring otherworld communication. The West Wind reminded the right-handed twin: as above, so below. Thus when the West Wind opened the portal from the Sky World to the earth so was a portal opened from the Earth to the Underworld so that the left-handed twin could travel from the abyss to his long awaited home as well. He lives in a place that knows the world of men well, and he finds contentment in it. He hears the sound of warfare, torture and injustices and he finds them good. The left-handed twin also has many names. One of them is Flint. He is called the devious one, the one covered in boils. Old Warty. He is stubborn. He is thought of as being dark in color. His realm is the night, the shadow-lands, despair and the full moon of his grandmother. The Tree of Life is in full bloom with her ambrosia fruit. It is a 5,125 year moment. The shamans are singing. 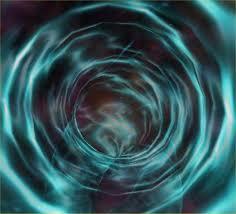 The portals are open. You may ascend or you may descend depending on your chosen path. Thank You for this story, the time is now and the Portals are opened. And of course they were right weren’t they? Oh come on you are making me blush 🙂 You look very pretty with that mud mask, your husband is a very lucky man. I think you will like this one, it is a bit long though. my mud mask… now that’s an oldie, I’ll have to go a’scrolling and see what you see; ha, wondering what you look like in a mask?